Polish roast duck with apples and potatoes is a wonderful meal that is surprisingly easy to make. It looks so elegant to serve a whole duck and it simply stuffed with apples and served with potatoes that are cooked in the duck fat. Honestly potatoes cooked in duck fat is rich, decadent and heaven! It would not be uncommon for a Polish woman especially in the rural areas of Poland to buy a live duck and bring it home and butcher the duck herself. Duck blood soup is a delicacy and then you can additionally roast the duck as well. Thankfully I was able to get a duck at my local Asian market and it was all ready to simply roast after a rinse and a bit of seasoning to rub on the skin. Fresh marjoram and caraway seeds along with salt and pepper are the flavors that season this succulent Polish roast duck. The cavity is stuffed with tart apples that are peeled, cored and cut into bite size pieces. I used granny smith apples as they are great for baking and the tartness went beautifully with the richness of the duck and potato. The potatoes do not even need to be peeled unless you prefer them that way. You simply throw them in the bottom of the pan and let them gently fry in the duck fat. Seriously when I said it was easy, it is really easy and so gourmet. You will want to use a roasting pan to make this all work out properly. I love this one. The hardest part of the process is carving the duck. I learned how to do it (sort of) when I made the Peking duck for China. The truth is you can cook the duck until you can literally with your hands remove the pieces because it is so tender. Obviously carving it would make for a prettier presentation. 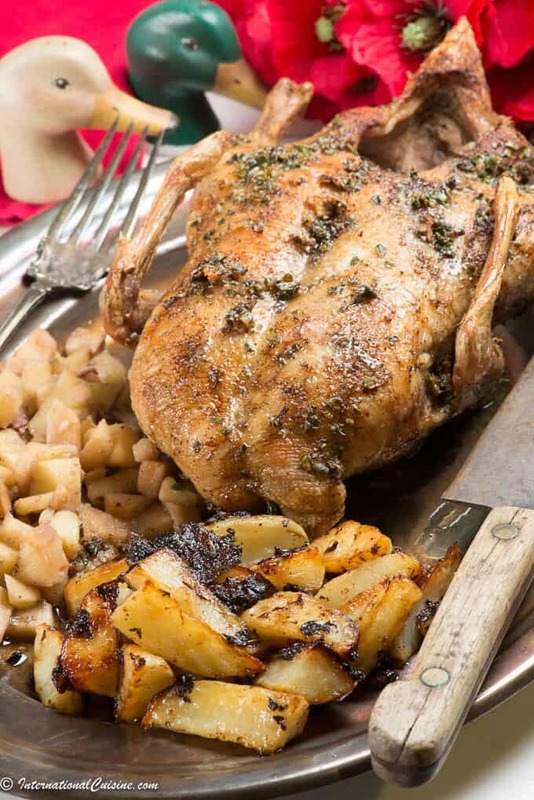 However you get the meat on the plate, you are sure to love this Polish roast duck with apples and potatoes. Be sure to check out “Our Journey to Poland” to learn more about this unique country with so much history and amazing food. Please note that this page may contain affiliate links in which I will earn a small commission however, it will in no way affect the price you pay. I thank you for your support! I only recommend products I use and love myself. 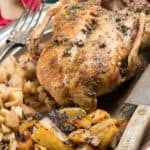 Polish roast duck with apples and potatoes is a super easy meal to make and oh so gourmet, you will love this.... who doesn't love potatoes cooked in duck fat? Rinse the duck with water and pat dry. Wash, peel, core and chop the apples into small chunks and stuff the cavity of the duck. Rub the skin well with the marjoram, the garlic, and salt and pepper. Place on a large plate, cover, and leave for 45 minutes to marinate. Place the duck in a roasting tray. Collect any marinade left in the plate, and add some more water to make up one cup of liquid. Pour this liquid in the bottom of the roasting tray not over the duck. Roast the duck uncovered for 10 minutes, then reduce the heat to 325°F and cook for 2 hours. Every half an hour or so use a skewer to pierce the duck skin with holes to release its juices and then baste the duck with the liquid that collects in the bottom of the pan. Clean the potatoes and cut into halves or quarters you can choose whether or not you want them peeled. Either way is fine. When the duck still has about an hour to cook, salt the potatoes, place them in the tray with the duck and sprinkle with caraway seeds. They will start to fry gently in the duck fat. When you next baste the duck, turn the potatoes, making sure they are well covered with the duck juices. The duck should be so well cooked that it can be easily pulled apart. It's not to easy to carve a duck but can certainly be done.